In 1906, the British launched one of the most revolutionary ships ever built – HMS Dreadnought. Besides being a big ship powered by turbines the ship was constructed with „all big guns“. This meant that the earlier battleships were typically equipped with just 4 main guns intended to engage other battleships plus an additional number of smaller guns to engage cruisers. The Dreadnought dispensed with the smaller weapons to increase her main battery to 10 12in guns, making her broadside twice as powerful as any other capital ship in the world. This design effectively rendered all other battleships obsolete, and sparked a naval shipbuilding race between the naval powers which consumed a huge portion of their industrial capacity up to and during WWI. 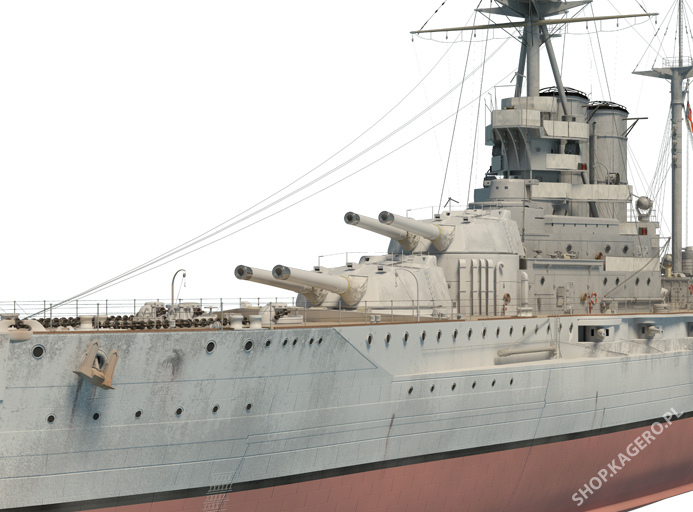 Several battleships of different classes were built but learning that both Japan and the United States were implementing 14 inch guns decisive measures were taken to keep the Royal Navy ahead – the Queen Elizabeth class with it‘s fearsome 15 inch guns were therefor introduced. In 1913 the British launched HMS Queen Elizabeth which was often described as a Super Dreadnought: bigger, faster, and more heavily armed and armored than any other ship. During the next few years 4 more ships where launched. A second decision regarding the armament was also to be made. The first Lord of the Admiralty, Winston Churchill, strongly advocated for the new untested 15inch guns for the ships main armament. These guns were developed in secret as a 14inch test gun. They were finally installed and soon after launch were proven a great success at the Battle of Jutland where the ships gunnery capabilities were specifically mentioned in battle report of the German Battlecruiser commander – Vizeadmiral Franz Hipper. The ships were designed to a displacement of 31.500 tons but at the very beginning this number proved to be too low. 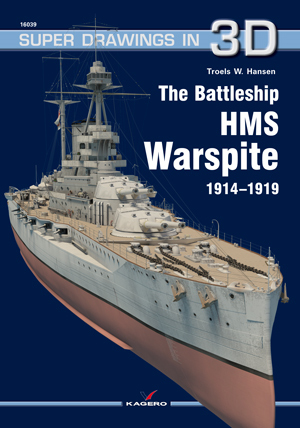 At launch Warspite weighted 33.140 tons – a number that continued to rise throughout its entire career although 1400 tons was saved from new machinery in the 1934 refit. The weight issue meant that the intended 25 knots was never reached. Propulsion The design speed was 23 knots at 56.000 shaft horse power. At trials in 1915 the ship ran 24.1 knots at 56,600 hp. At an overload of 75,500 hp it managed to go 24.65 knots – just above half a knot for 20,000 hp....quite modest. In the 1934 refit programme new machinery was installed which gave 80.000 hp and the oil consumption was reduced by 30%. Furthermore a considerable space and weight reduction was achieved. The ships were equipped with 4 three blade propellers. They had a diameter just above 11ft and operated at a maximum of 275 rpm. Two rudders were placed to give the manoeuvrability required for naval operations. The placement between the propellers instead of behind them gave them poor manoeuvrability at low speed but good at high – which of course is beneficial for a ship of war.